Hydromat Inc. New “Eclipse”, a Larger, More Powerful Rotary Transfer Machine introduced at IMTS 2018. ST. LOUIS, MO –Hydromat Inc. presented the new Eclipse 12-100, a unique 12 station Rotary Transfer machine for the first time at a trade show during IMTS 2018, September 10 – 15. 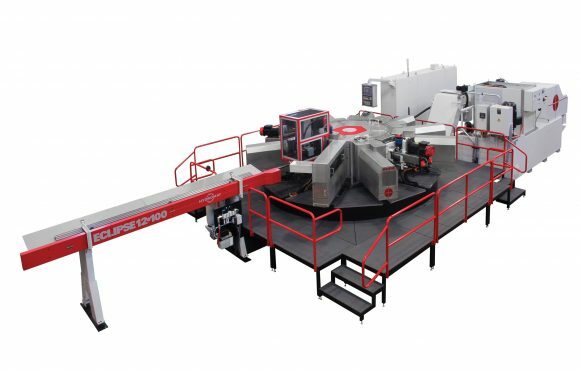 The Eclipse was an instant success with much attention paid to the expanded capacity and new technologies employed in this rotary machining center. The Eclipse is a ground up re-design of the famous Hydromat concept with all new components. This machine platform offers multiple tool spindles in a single footprint integrated with one chip management & coolant system. The Eclipse features a one-piece, heavy duty cast iron machine base that is 2m in diameter, nearly twice as large as the traditional 12 station Hydromat machine. This new ductile iron casting is designed for the use of 3-axis and 4-axis all electric servo, quill type tool spindles. No hydraulics are needed for tool spindle motion as in Hydromat machines. These new technologies along with the beefier base yield exceptional accuracy and repeatability. Designed to be exceptionally ridged, these modules were designed with beefy castings for superior vibration dampening properties and maximum precision. The bar fed collet version of the Eclipse 12-100 has a maximum workpiece diameter of 65mm (2.5”) and features a maximum workpiece length of 180mm (7”) with 127mm (5”) of material outside the collet. The Eclipse will also be available in an Indexing Chuck version that will feature a table with vertical chucks capable of 360° rotation of the workpiece. This system is ideal for mid to high-volume, precision production of irregular-shaped castings or forgings and is designed with the flexibility to easily accommodate families of parts. The Eclipse Indexing Chuck machine will utilize hydraulically-actuated, self-centering two- or three-jaw chucks, or custom clamp fixtures, to provide the highest accuracy and part clamping rigidity. Workpieces are mounted in the chucks by robotics or pneumatic loaders. A revolutionary new cut-off saw was designed by Hydromat Inc. engineers at their headquarters in St. Louis, Missouri. It features bar and workpiece spacing prior to saw blade retraction after the cut, moving both the saw blade away from the workpiece in the collet and the bar stock away from the blade, to eliminate the blade dragging during the saw’s return to home position. A two-speed drive motor with belt reduction yields a highly accurate cut. The saw utilizes standard size 360mm diameter carbide brazed saw blades. The blades are flanked by replaceable guide supporting pads to dampen blade harmonics. A high-pressure flush to clean the blade gullets of chips is standard. The 3-Axis toolspindles are larger than previous Hydromat spindles to accommodate the heavier cuts and larger parts and machined with this platform. They are designated as 55/250 units, referring to the 55mm front bearing size and a 250mm stroke at the Z axis. The X-Axis stroke is 80mm and the Y-axis is 100mm. A coolant fed option is available. The 55/250 4-Axis Profile Toolspindle Module offers a flange spindle for mounting a dynamic profile turning head with 30mm X(2)-Axis stroke, or a Ø 160mm dual or single slide profiling head for 5,000 rpm cutting. The units utilize HSK 50 tool holders, and they are a stout design weighing in at 536 kg total mass. These units are direct drive powered by a Fanuc ailT6/12000HV motor with a KTR GS38 coupler. This motor continuous rating is 5.5kW at 7.4HP and a 30-minute rating at 7.5kW at 10HP. It has dual windings and pumps out 35 Nm at low speeds and 13.2 Nm at high speeds. The high-resolution encoders and the latest servo and spindle HRV Control realize Nano Control Servo system with high speed, high precision and high efficiency. The ai series motors are best suited to large size machine tools because it has high power up to high speed, and has high torque at low speed, well suited to the milling axis of large machines and large lathes. An optional 20,000 RPM tool spindle powered by the same Fanuc aiIT2/20000 is also available. It features a proportionally lower cutting force related to the higher speed. The bearing configuration is the same as the 12,000 RPM version, but features a KTR GS28 coupler on this configuration. Both the 12,000 and 20,000 RPM Eclipse units are through spindle coolant capable. A new CNC head, also designed by Hydromat, features an outside diameter of 160mm with a radial stroke of 25mm. The Eclipse features quick-change, presettable tool heads for easy changeovers. The Eclipse 12-100 machine is the solution for the elimination of secondary operations by producing parts complete from bar stock, castings, forgings or cold formed blanks. The new Eclipse machining platform eliminates secondary operations and reduces work in progress. Additional cost reduction occurs due to extremely short remnants and thin cutoff for significant material saving. This multi-station transfer technology enables load and unload processes on station one, and simultaneous machining on the other 11 stations, making the Eclipse ideal for medium to high production of complex work pieces requiring multiple operations, complex cuts, and where tight tolerances are critical. The Hydromat Eclipse engineering team embodies a rich history of manufacturing disciplines and they work closely with the customer to develop an innovative production solution. The Eclipse supports Lean Manufacturing principles and competitive manufacturing at small, medium and large production quantities. Hydromat, Inc., is the industry leader in the manufacture and assembly of precision transfer machines — Rotary, Inline, and Trunnion models, as well as the ICON 6-250 Productivity Center and ICON 6-150 & 8-150 Mill/Turn Centers — and has a reputation built on a commitment to product quality, customer service, and technological innovation. The Eclipse offers a high degree of machining flexibility derived through engineering exper-tise coupled with a visionary concept, the type of creative thinking that has produced this superior Rotary Machining Center for small to large batch production.